The rent at Lamberton Lake Apartments ranges from $989 for a one bedroom to a $1,099 one bedroom. Apartments in this building are about 1% more expensive than the Creston average. This is a pet-friendly apartment. This apartment is in the Creston neighborhood in Grand Rapids. Lamberton Lake Apartments has a Walk Score of 35 out of 100. This location is a Car-Dependent neighborhood so most errands require a car. 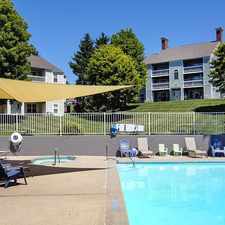 Snug along a beautiful, private lake, Lamberton Lake Apartments feels like a resort hideaway in Grand Rapids, MI. Drive down a private, wooded lane to arrive at our lushly landscaped community. Enjoy our private lakeside beach, walk along our nature trail, and enjoy a game of beach volleyball or horseshoe. Picnic by the lake, go fishing, or sit by the fire pit in the evening. Once you retire to your pet friendly apartment, you will still be able to enjoy incredible views of the lake! Lamberton Lake Apartments also include custom paint colors, hardwood style flooring, huge closets, and fabulous kitchens. if you are ready to live like you are on vacation every day, call Lamberton Lake Apartments today! Explore how far you can travel by car, bus, bike and foot from Lamberton Lake Apartments. Lamberton Lake Apartments has some transit which means a few nearby public transportation options. View all Creston apartments on a map. Lamberton Lake Apartments is in the Creston neighborhood. Creston is the 22nd most walkable neighborhood in Grand Rapids with a neighborhood Walk Score of 44.